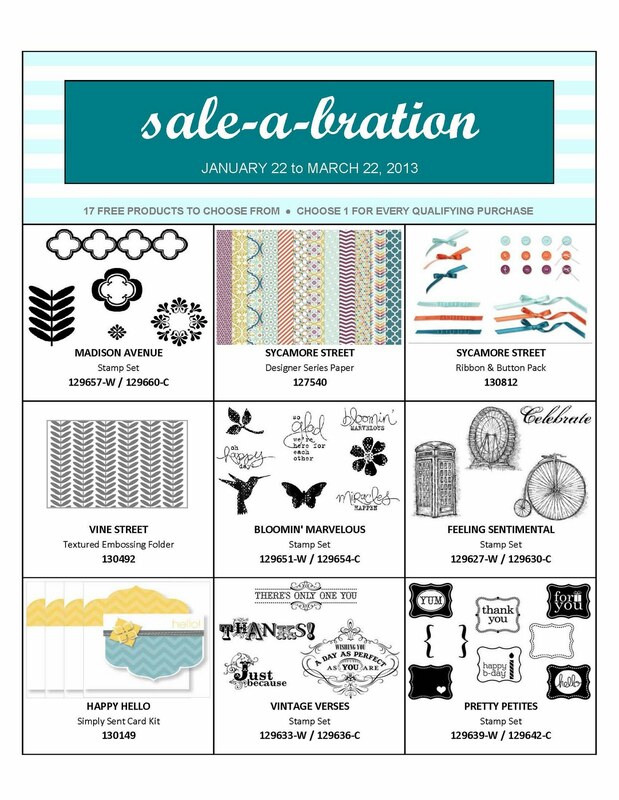 Elaine's Creative Musings: SALE-A-BRATION IS HERE!!!! 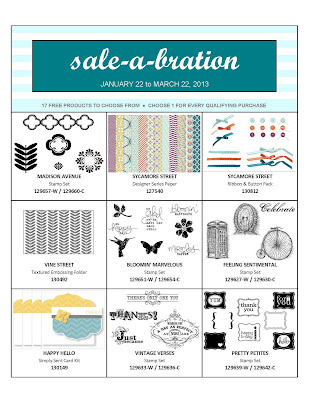 Sale-A-Bration, Stampin’ Up!’s premiere promotional event, is an annual party with loads of free products! This year’s party is better than ever—we’re celebrating our 25th anniversary! So put on your party hat and BYOC (bring your own confetti). Get a FREE hostess bundle when you host a 425 €/£300 workshop! 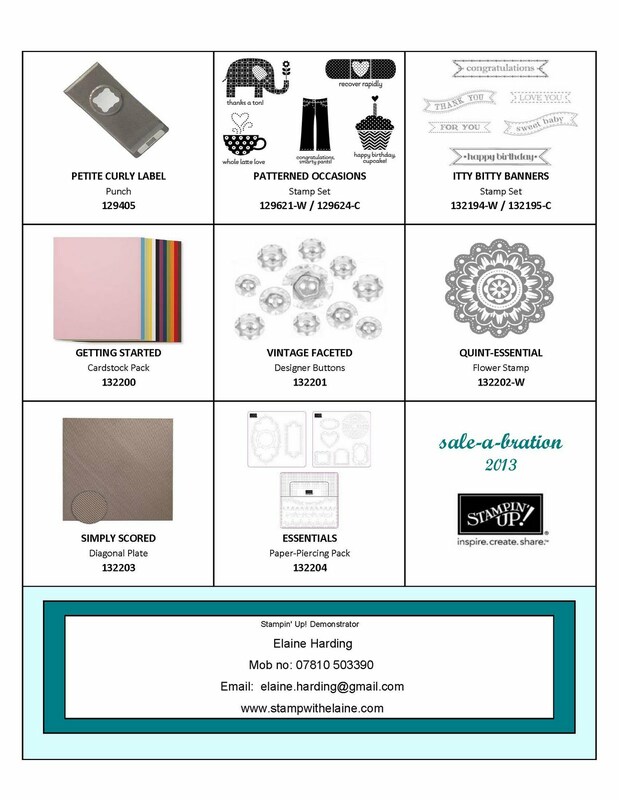 *, FREE Silver Glimmer Paper, and receive £50 Hostess credits to spend in any of the current catalogues plus choose 1 full priced item at 50% discount! *Offers are not incremental (i.e., a hostess does not receive two packages of Glimmer Paper for a 400 €/£300 workshop or two bundles for a 850 €/£600 workshop). 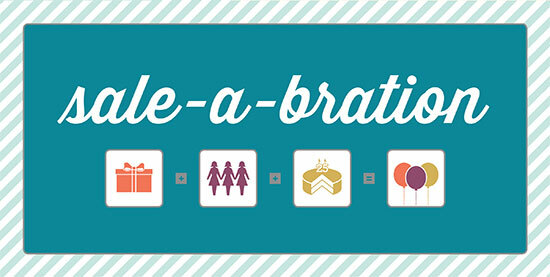 Customers may choose any one product from the Sale-A-Bration brochure for every 60 €/£45 they spend. This year’s offering includes exclusive stamp sets and accessories, as well as a selection of catalogue stamp sets, ribbon, buttons, and even an embossing folder! Now, more than ever, there’s something for everyone! 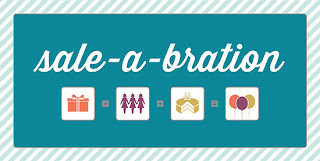 Sale-A-Bration + Stampin’ Up!’s 25th anniversary = 25% more Starter Kit products for FREE! The normal starter kit value is £129 worth of product - you pay £99.00. However during Sale-A-Bration, you still pay £99.00, but you will be able to customise your starter kit with products up to a value of £162.50! On top of that you have additional business supplies worth £45.00. Signing up is easy - you can now do it on line, so do contact me, elaine.harding@gmail.com and ask me how!